Ubisoft announced that UNO for the PlayStation 4 has been updated with PlayLink features, adding an extra oomph to the classic game. Players can now access the game via their mobile devices and play together locally with ease. The update is free, so UNO remains at its original $9.99 price point on the PlayStation Store. Play with friends on your smartphone: Up to four people can now play UNO together locally, using their smartphone as a controller, by downloading the UNO PlayLink app and connecting to their PS4™ system. Players can choose to team up or play against their friends. 7-0: Playing a 7 allows players to swap hands with another player, and playing a 0 forces all players to take their hands and pass them to the next player. Jump-In: Whenever a card is played, players can play immediately if they hold an identical card, even if it is not their turn. Draw-To-Match: When there is no hand to play, players have to continue drawing until they can play a card. Choose different themes for a more varied experience: Spice things up by playing with two additional deck themes. Be surprised by the crazy Rabbids’ actions or get a refreshing feeling with the winter theme. 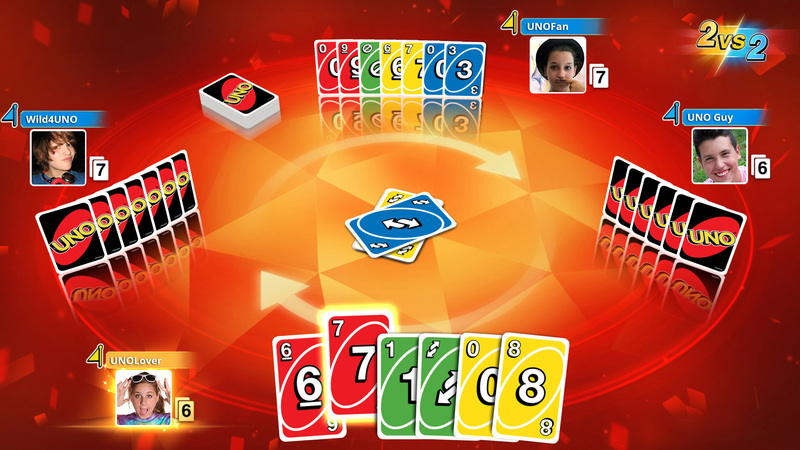 Online multiplayer: Find players online and challenge UNO-lovers from around the world in the online mode.